SPEAKING AT THE annual conference of the National Association of Principals and Deputy Principals (NAPD) today, its president Cathnia O’Muirtheartaigh said that having over 3,000 children homeless is a “blight and a stain on our Republic”. Minister for Education, Richard Bruton, had addressed the conference earlier, and O’Muirtheartaigh made a direct appeal to him to ensure that staff and students in disadvantaged schools have immediate access to counselling. The principal had been talking of the supports that parents can give their children and how important it is to nourish children’s health. He said: “Sadly, we are also acutely aware, of the unfortunate reality, that many of our students do not have the supports we would wish for in their home environments. In that context let me refer to one major scandal in our society. No young person should be entering school in the morning having come from a hotel bedroom, a homeless shelter, a women’s refuge or from couch-surfing in their grandparent’s or other family member’s overcrowded home. The fact that over 3,000 children and teenagers are currently homeless in our country is a blight and a stain on our Republic and must end. O’Muirtheartaigh said that school staff need more supports from the government to help children who are experiencing homeless, and urged the minister to take action. “We as school leaders and many of our teaching colleagues are struggling to find the skills and the resources to help these young people to overcome their difficulties and hopefully begin to try again,” he said. 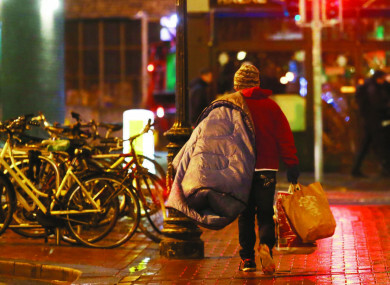 According to the most recent figures, the total number of homeless adults accessing emergency accommodation in the State in August increased to 5,222 from 5,187 in July. The number of children living homeless increased more sharply however from 2,973 to 3,048, passing the 3,000 mark for the first time. O’Muirtheartaigh went on to say that principals are under enormous pressure, and also highlighted the shortage of supply teachers and said that qualified teachers who go abroad can earn far more. He said that much of the summer holiday time was taken up with advertising for positions, shortlisting applicants, interviewing them and then offering the role. After all that, it can be situation where a principal is left “to be told, at the very last moment, that they’ve accepted the contract in Dubai and will be smiling at us from their Facebook profiles a few months later over their pina coladas as they earn tax-free salaries that we, as school leaders, could only dream about”, O’Muirtheartaigh said. Email “Children coming to school from hotels 'is a blight and a stain on our Republic' says principal”. Feedback on “Children coming to school from hotels 'is a blight and a stain on our Republic' says principal”.